In the tropics, between the months of October and May there are marine stingers present in our waters. People often get confused about Box Jellyfish and Irukandji. Many visitors don’t realize that the same, or similar, species of stingers and box jellyfish are also found through South East Asia and other parts of the world . Stingers is a term that is used to refer to either Box Jelly fish or Irukandji . 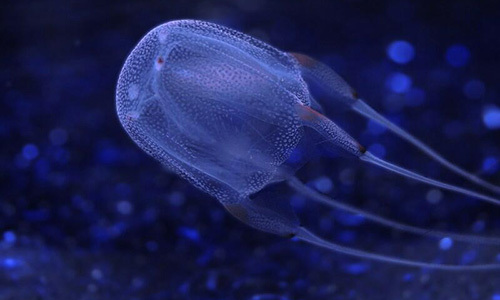 Box Jelly fish stingers only live near the coast. The outer reef is about 32 nautical miles offshore so Box Jellyfish stingers are not a threat to in water safety while snorkelling at the Great Barrier Reef. They are of course a threat to beach goers, which is why the popular beaches in North Queensland have stinger nets. The box jellyfish stingers are almost invisible in the water and have long draping tentacles. Because they are a larger stinger, Box Jellyfish can be effectively caught in the stinger nets on some of the beaches. However when the weather is rough and the waves are bigger, sometimes the Box Jellyfish can get into the stinger nets. If you are planning on swimming at any of the beaches please ensure that you only swim in netted beached and always wear a lycra suit. Irukandji Stingers inhabit the outer reef and islands. They are tiny Jellyfish about 1cm2. There are a number of species of Irukandji Stingers. Symptoms from an Irukandji sting can include a feeling of impending doom, intense pain, back ache and sometimes even a rise in blood pressure. Usually victims do not feel the initial sting. The stinging cells of the jellyfish cannot penetrate lycra. The full body lycra suits, whilst unflattering for many of us, are also an excellent way to protect you from sunburn as well as from the possibility of a marine sting. All marine operators should request that you wear a full body lycra suit while snorkeling during the months between October and May inclusive in order to protect you from marine stingers. This entry was posted in Dangers Of The Great Barrier Reef, Great Barrier Reef, Holiday tips, Marine Stingers, Scuba Diving, Snorkeling and tagged Box jellyfish, Irukandji, lycra, sea wasps, sting, stingers. Carolynne has been a Port Douglas "local" since 1995 Her travels have taken her far and wide, from Southern Australia to Europe, from Port Douglas to Cape York, Lizard Island and many places in between. With a career in tourism spanning decades that has seen her manage hotel tour desks in five star resorts, as well as manage tour boats in Port Douglas; she enjoys writing about the best possible experiences of tours and activities around Port Douglas and of course her favorite destination...the Great Barrier Reef.